DO-94460-45 was succesfully added to your cart. Control heating elements, cooling blocks, hot plates, heating mantles, cooling systems, or incubators to ±1°C. Brilliant ½''H LCD displays the temperature and time; red LED shows on/off mode. Accuracy is traceable to NIST standards. Battery keeps settings safe from power outage for one year. relay, 3½-ft relay cable, 3½-ft sensor cable with integral sensor, certificate of traceability to NIST standards, and two AAA batteries. can the probe/sensor be submerged in water. Can one be connected to this unit to do so? The probe that comes with this controller is submersible. How do I set the timer controller to shut off the electrical power to equipment after a set time frame (for example after 12 hours)? This product can only be controlled using the time of day feature, instead of a countdown timer. So you will program the "off" function at a particular time of day. I want to contorl a light duty fan to run (ON) if temperature is between 20 and 35 F. Else OFF. Will this controller work outright, or will I have to invert the logic say with an external relay to get what I want? What will the controller do if the probe sees a temperature outside of its setting range? Is it harmful to he controller if it is located in an unheated area like a garage or shed? Temperature range -25 to 120 F.
This unit could control a fan, when put into temperature control mode, so go on when the temperature goes above a certain point. However, it would turn off once the temperature raised above 20 F if that is the original set point. There is no way to create such a large deadband on this simple controller. Please call us to discuss further, perhaps another controller would be more appropriate. 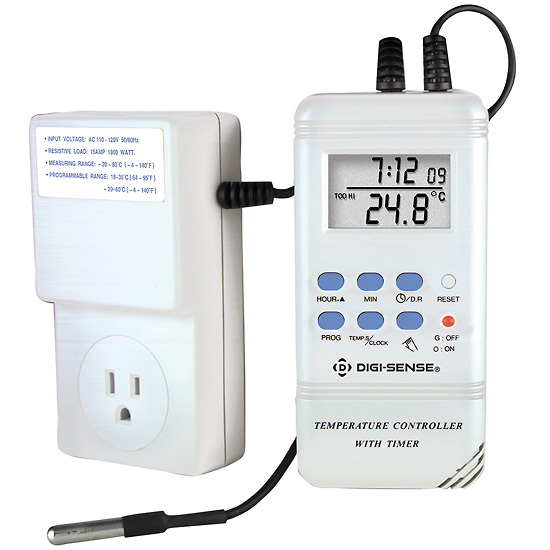 This controller can either be used to control equipment based on temperature (In your case keeping it around 78) or it can be used as a timer (turning the equipment on at night). It can not be set to a combination mode where it will do both at the same time, however. Used to control cooler. It's worked well so far. We are using this product to monitor a cooling plate that is cooling 600 watts. If the temperature goes above 75 DegF, which indicates that our cooling water is not circulating, it will shut the power off to the devices under test. Easy to setup and use. Very reliable.